Light Up Earrings, are 7mm cubic zircon, have LED lights behind each stone, light up at night with a special battery. These earrings are really cool you will love them, you will get noticed. Light up the party, dance floor, clubs or events at night, just cruising around. A perfect item for friend and family. Colors in red, blue, white ,pink ,green . Features Specifications:flash earring, light earring ,led earring. 2.Five colors ; red ,blue ,white ,pink ,green . 6,the newest develop ,newest model , our factory guarantee each earrings is light and change the battery is easy ,no any wastage . 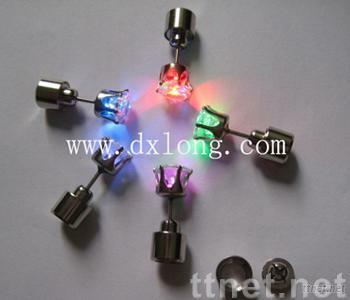 LED earrings -----Newest earrings Have 5colors, red, blue, white, jade green and pink color. Very , the flashing earring can change 7colors .